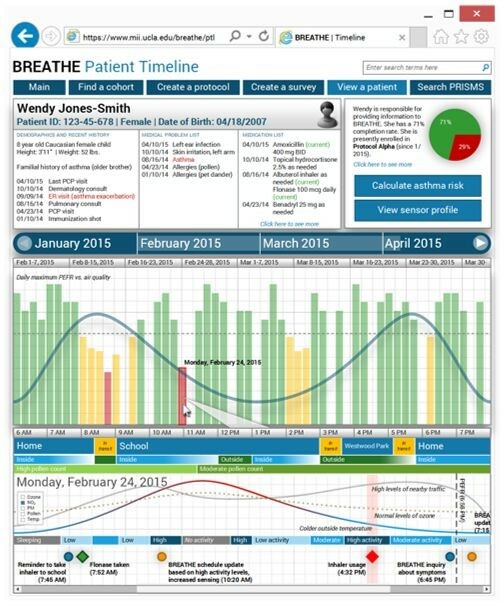 Research Computing worked with teams across UCLA and USC to get the BREATHE platform up and running in the AWS Cloud. Unlike older, segmented computing solutions, the cloud computing environment enables the complex workflows behind BREATHE’s platform to operate in a centralized location. The BREATHE platform collects environmental and physiological data on research subjects who wear Internet of Things (IoT) sensors. The platform processes the data and sends it back to the devices in the form of a recommendation or insight. Researchers hope the platform’s insights will help caregivers predict and prevent asthma attacks in children. 24/7 data collection from IoT devices. Collected data includes heartrate, air quality factors, and more. Real-time algorithms to process data—integrating it with medical histories and other factors—and provide research subjects with recommendations. Post-analysis to improve machine-learning algorithms. Data sharing within UCLA and with partner institutions. Research scalability and flexibility, as the cloud environment can be easily updated as needed. For example, the project’s second phase will bring into the platform real-time environmental data from government agencies (e.g., EPA) and other services. Learn more about research on AWS.